Healthcare services in India is still an unexploited market and the Home Healthcare market currently at a nascent state, is all set to disrupt the conventional healthcare business model and medical service space in India. Given the backing from big funding houses, the significant need gap and access to new age technology, players are taking big strides to expand their market and services to create value. Today's world is largely driven by the word 'convenience'. From having your meal delivered at your doorstep, to the more expensive electronic purchases now possible by the click of a button, to more complex service spaces such as education and now healthcare the gamut of possibilities both in product and more recently in service sector delivery is undergoing a paradigm shift. The in-home healthcare business model is about bringing essential patient care & health services to people at the convenience of their home. Some of the biggest benefactors of this service are ageing adults in need of regular medical care, patients recovering from hospitalization & paediatric patients. Apart from the benefit to patients in terms of convenience and cost savings, the service also helps in de-congesting hospitals for more critical care needs. India's geriatric population is about 100 million today and is expected to grow to about 200 million by 2018. This along with the rising working population, increase in the occurrence of chronic diseases, the significant increase in healthcare awareness & the increasing need for convenience has contributed to the emergence of in-home healthcare providers in India. 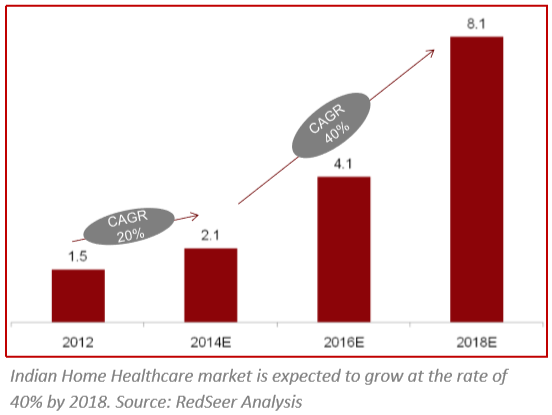 The global market for in-home healthcare is projected to grow at a rate of 7.7% annually and is estimated to be valued at 306 billion USD by 2018. Still, in a nascent stage, the Indian in-home healthcare market is currently valued at 1.5 billion USD and is projected to have a staggering growth of 20% over the next two years and a 40% growth rate between 2016 & 2018. From the consumer point of view, the in-home healthcare business model is a boon especially as the rising education & employment levels have left urban dwellers with limited time to cope with geriatric care & pediatric care needs in their households. This service is also a great saviour to expats who have their ageing parents living at home in India. 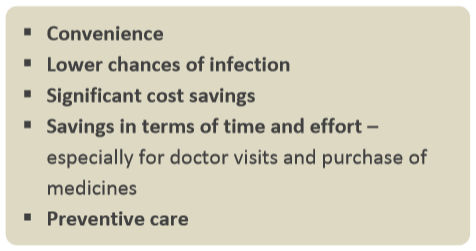 Lower infection rates and the benefits of preventive treatment (Glaucoma for example) in ailing patients are the other key advantages of the service. 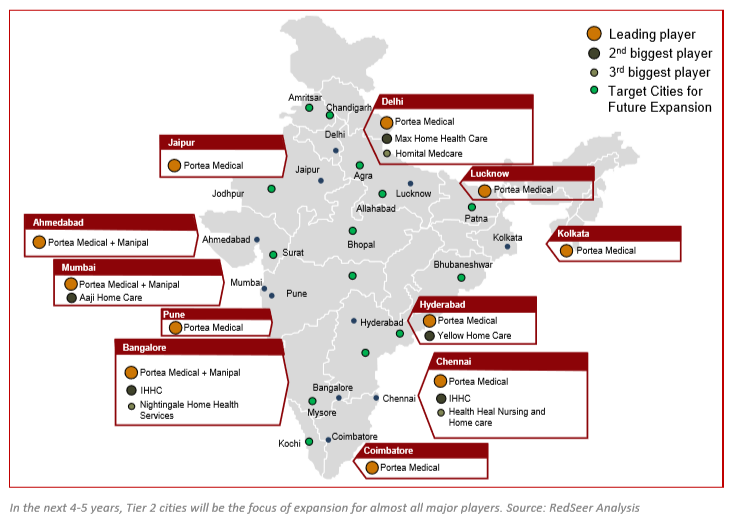 The Indian in-Home healthcare market is dominated by a few players. Primary players in the market include Portea Medical, India Home Health Care (IHHC) & Homital. Portea Medical (established in 2012) is the most aggressive player in the market currently and is present in 11 cities and has staff strength of 600. It is also the frontrunner in technology adoption and uses an in-house app for centralized patient records, hand held devices for field staff and GPS tracking for monitoring of logistics. IHHC and Homital operate in fewer cities, but have plans of expanding to more cities in the near future. Growth and expansion are definitely on the anvil for all the players with Portea Medical leading the way, having received their first round of VC funding of 8 million USD from VenturEast and Accel Partners for a combined 30% stake, while US based Bayada Healtcare has invested in a 26% stake in IHHC. To maximize their reach, in-house healthcare service provides are also partnering with leading hospitals and healthcare chains such as Fortis, Manipal Hospitals, Columbia Asia, Sparsh among others. With increasing life expectancy and changes in disease patterns, the possibilities for in home healthcare is also expanding. Currently the services largely include nursing care, physiotherapy, post operative care & personalized doctor visits. Also popular are service packages for diabetic care and geriatric care. With such customized packages, in home healthcare, also leads to significant savings in both direct and indirect costs to the consumer. 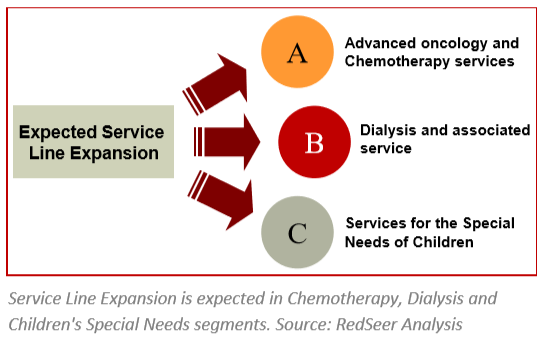 Experts are also exploring more application areas for in-home healthcare and service expansion is expected in the areas of Oncology, Dialysis and Children's Special Needs segments. In the coming months, renting of medical equipment during periods of nonusage is expected, so as to improve asset utilization and aid revenue enhancement for the players. The most commonly availed service offerings currently are nursing and caretaker visits. Some of the services for this segment involve post surgical care, oxygen administration, suture removal and IV infusion. Annual care packages are also fast gaining popularity; fast growing in this service segment are diabetic care and senior care services. The annual package includes regular visits from a nurse and also visits from doctors, a set number of times per week. These care packages are highly customized and prices vary from case to case. Doctor visits and physiotherapy services are another area bringing in significant time savings to the customer. Being part of an emerging market, the industry poses its own set of challenges. Some of the current challenges impeding growth are employee retention, creating awareness, technology challenges, low margins leading to scaling difficulties, operational issues such as inconsistency in quality and lack of standard protocols for in-home healthcare training. Major players are facing low employee utilization rate and rising wage bills. 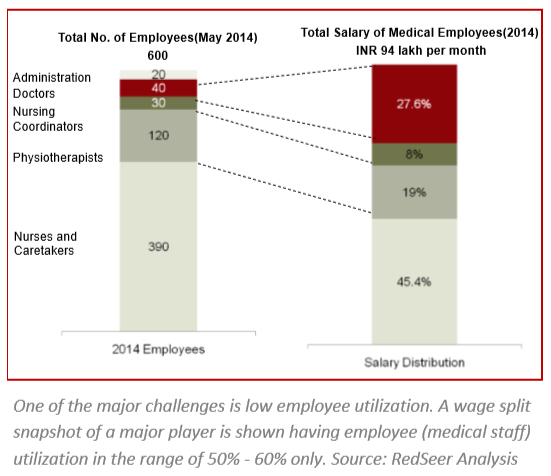 Players are exploring options such as changing employee mix (hiring of more nurse aids/associates to reduce wage bills), building a 'network panel' of doctors/nurses to cater to excess demand that can't be handled by permanent staff and having 'On-call' staff to reduce operating costs. Leading players such as Portea Medical believe in disrupting the industry through technology. Of the $8 million it raised in its first round of funding, Portea has earmarked a $2 million for investments in technology. Portea's technology applications include remote monitoring technology to aid clinicians, cloud based mobile health systems to monitor patient's vitals, real time electronic patient record update apps & in-house work allocation system to optimally allocate work to on-field staff. The home healthcare market in India is all set to disrupt the conventional medical service space in the near future. Venture capitalists and investment firms have identified the market as being viable for investment, given the current healthcare demographics, socio-economic shifts and the significant need gap. This key contribution from investment firms, is helping players build scale and achieve sustainability. Technology will enable players in building competitive advantage. Portea for instance is supported by a mobile app on the back end to improve efficiency and accuracy. Wearable technology with varied applications areas such as patient medical vitals monitoring are areas which are currently being explored. Operational efficiency and bottom line expansion will be driven by technology adoption and effective capacity utilization. The business model that is followed by most players today is to have collaborations with leading hospitals to generate referrals; a major portion of today's inhome healthcare consumers come from referrals of doctors and hospital chains. In the next 4-5 years, as the major players gain critical mass, their bargaining power with hospitals is set to increase significantly. The referral fee as a % of revenue shared with Hospitals currently is around 15-20% but is expected to come down to 8-10% by 2019. Another trend that is observed is that a few leading hospital chains have started to extend their own home healthcare service. Given these two factors, a shift from the current business model is expected in the future. Players are also heavily spending on marketing activities, both residential awareness programs and digital marketing (social media page, blog setup, search engine optimization and mobile app development) to increase awareness and expand reach. Key developments are expected in areas of insurance, regulations and service protocols. Market operators are working towards including home health service to be part of health insurance. Strong focus is also given towards developing standard service protocols to ensure consistency in quality, which will lead to build service credibility. Given the significant need gap, influx of VC funds, technological advances & service expansion, the health care in home industry in India, currently in its fledgling stage is set to witness massive growth in the future.